Tutorial for new R users whom need an accessible and easy-to-understand resource on how to create their own histogram with basic R.
This is the first post in an R tutorial series that covers the basics of how you can create your own histograms in R. Three options will be explored: basic R commands, ggplot2 and ggvis. These posts are aimed at beginning and intermediate R users who need an accessible and easy-to-understand resource. Want to learn more? Discover the R courses at DataCamp. A histogram is a visual representation of the distribution of a dataset. As such, the shape of a histogram is its most evident and informative characteristic: it allows you to easily see where a relatively large amount of the data is situated and where there is very little data to be found (Verzani 2004). In other words, you can see where the middle is in your data distribution, how close the data lie around this middle and where possible outliers are to be found. Because of all this, histograms are a great way to get to know your data! But what does that specific shape of a histogram exactly look like? In short, the histogram consists of an x-axis, a y-axis and various bars of different heights. The y-axis shows how frequently the values on the x-axis occur in the data, while the bars group ranges of values or continuous categories on the x-axis. The latter explains why histograms don’t have gaps between the bars. Note that the bars of histograms are often called “bins” ; This tutorial will also use that name. 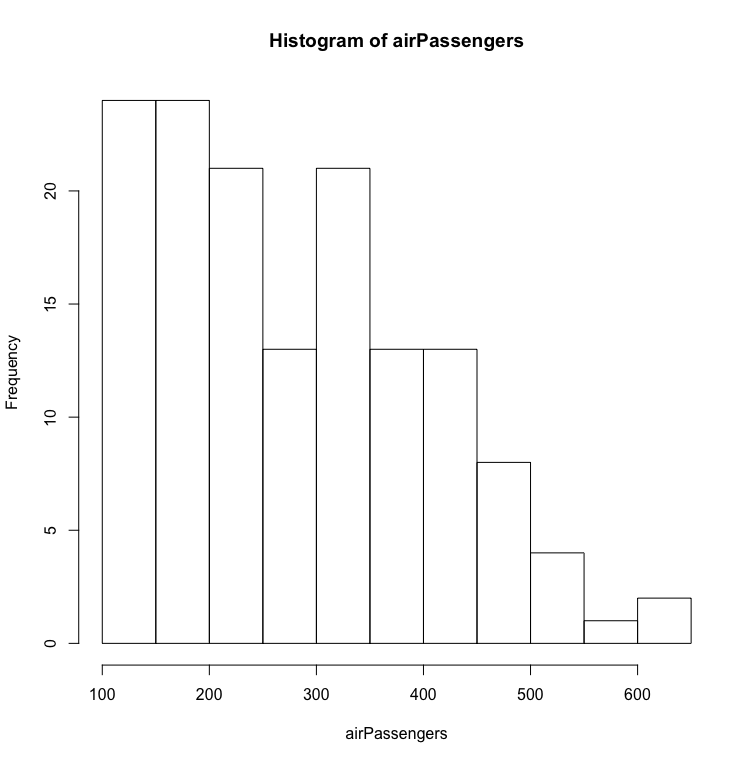 Since histograms require some data to be plotted in the first place, you do well importing a dataset or using one that is built into R.
This tutorial makes use of two datasets: the built-in R dataset AirPassengers and a dataset named chol, stored into a .txt file and available for download. Note that the chol data has already been loaded in for you! The histograms of the previous section look a bit dull, don’t they? The default visualizations usually do not contribute much to the understanding of your histograms. You, therefore, need to take one more step to reach a better and easier understanding of your histograms. Luckily, this is not too hard: R allows for several easy and fast ways to optimize the visualization of diagrams, while still using the hist() function. 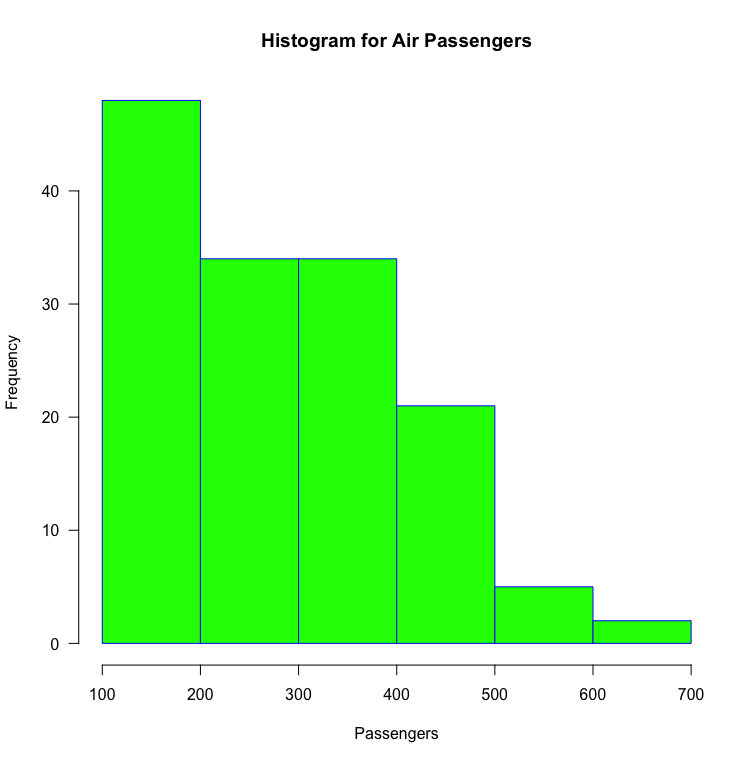 This code computes a histogram of the data values from the dataset AirPassengers, gives it “Histogram for Air Passengers” as title, labels the x-axis as “Passengers”, gives a blue border and a green color to the bins, while limiting the x-axis from 100 to 700, rotating the values printed on the y-axis by 1 and changing the bin-width to 5. Do you feel slightly overwhelmed by this large string of code? No worries! The following sections will break down the above code chunk into smaller pieces to see what each argument, such as main, col, …, does. 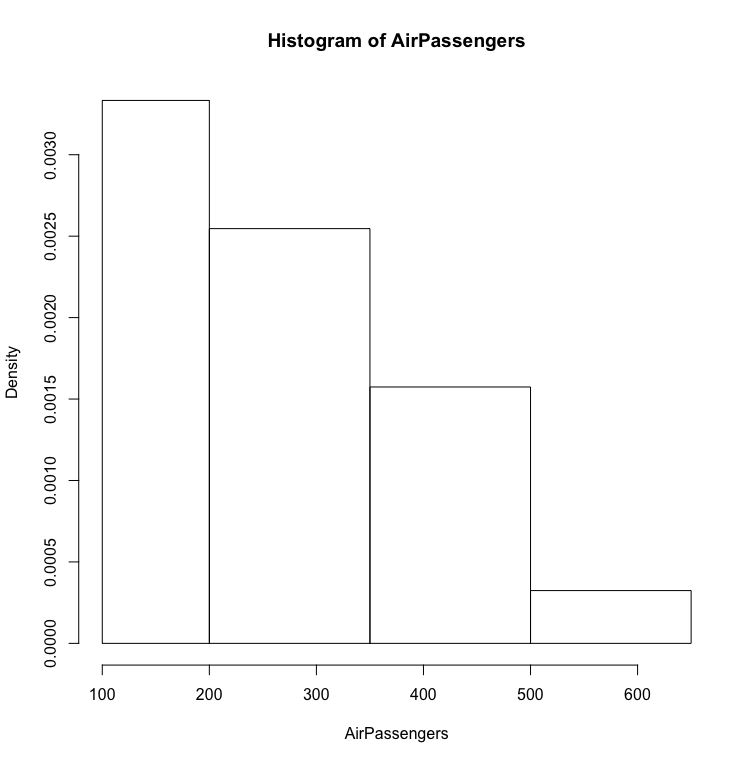 In the DataCamp Light chunk above, you have made a histogram of the AirPassengers data set with changed labels on the x-and y-axes. Tip: do not forget to put the colors and names in between "". In the code chunk above, your histogram has an x-axis that is limited to values 100 to 700, and the y-axis is limited to values 0 to 30. Note that the c() function is used to delimit the values on the axes when you are using xlim and ylim. It takes two values: the first one is the begin value; the second is the end value. You can rotate the labels on the y-axis by adding las = 1 as an argument. las can take the following values: 0, 1, 2 or 3. According to whichever option you choose, the placement of the label will differ: if you choose 0, the label will always be parallel to the axis (which is the default); If you choose 1, the label will be put horizontally. Pick 2 if you want it to be perpendicular to the axis and 3 if you want it to be placed vertically. In this case, your histogram has the y-values projected horizontally, because you pass value 1 to the las argument. Try changing the amount that you pass to the las argument and see the effect! The histogram that is the result of the line of code in the DataCamp Light chunk above has 5 breakpoints. In other words, the histogram that is the result of the code above has bins such that they run from 100 to 300, 300 to 500 and 500 to 700. However, the c() function can make your code very messy sometimes. That is why you can instead add seq(x, y, z). The values of x, y, and z are determined by yourself and represent, in order of appearance, the beginning number of the x-axis, the end number of the x-axis and the interval in which these numbers appear. This histogram starts at 100 on the x-axis and at values 200 to 700, the bins are 150 wide. Take a look at the result of this piece of code by looking at the following image or by executing the DataCamp Light chunk! Tip: study the changes in the y-axis thoroughly when you experiment with the numbers used in the seq argument! Note that the different width of the bars or bins might confuse people, and the most interesting parts of your data may find themselves to be not highlighted or even hidden when you apply this technique to your original histogram. So, just experiment with this and see what suits your purposes best! Note that this function requires you to set the prob argument of the histogram to TRUE first! For an exhaustive list of all the arguments that you can add to the hist() function, have a look at the RDocumentation article on the hist() function. 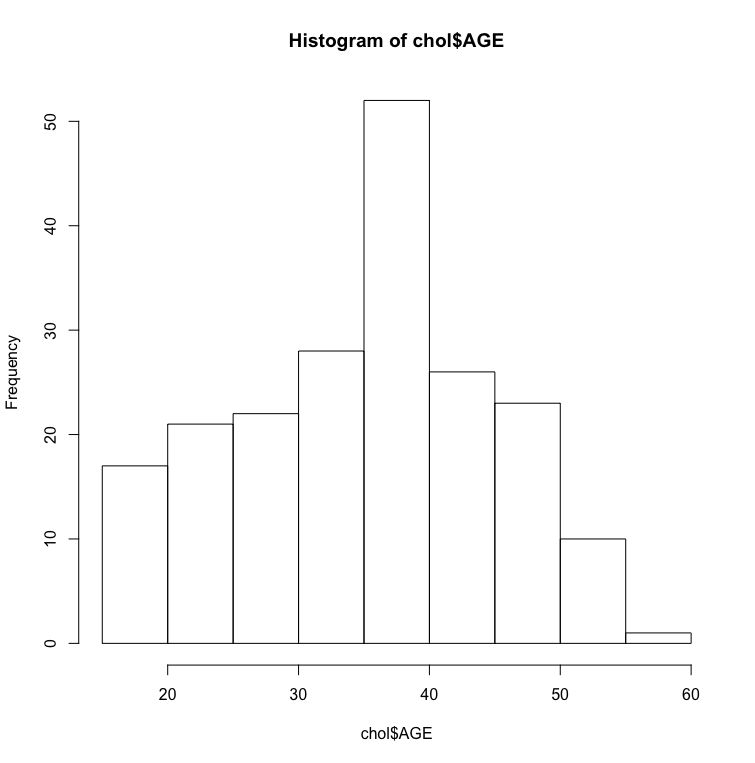 This is the first of three posts on creating histograms with R. The next post covers the creation of histograms using ggplot2.